Confused on Choosing the Best Pocket Knife for your Needs? What type of jobs will you be using the knife for? How large does the knife need to be to perform these jobs? What type of blade steel is best? When I look at a knife manufacturer's Web site these days, I have to admit that I am a little bit confused. You see, when I was growing up, our idea of an every-day-carry knife consisted of one of the many different types of traditional pocket knives and our idea of a tactical folder was an Italian-style stiletto. However, these days there seems to be a mass exodus away from the traditional pocket knife designs of old to what seems to me to be a long line of various designs of tactical folders which the manufactures all tout as every-day-carry knives; thus the reason for my confusion. Therefore, in this article, I am going to focus specifically on traditional pocket knife designs because, despite the mass exodus to what I perceive as tactical folders, I still believe that traditional pocket knife designs are a better choice for every-day-carry. But, before we can begin discussing what the best pocket knife for you particular needs is, we first need to define what a pocket knife is and what function or functions it was meant to perform. So, what is a pocket knife? Well, a pocket knife is defined as a knife that has one or more blades that fold into the handle and that can be carried in a pocket. However, this definition encompasses most any folding knife and thus, a further distinction needs to be made. So, for purposes of this article, a “pocket knife” is a knife with an overall, closed, length of no more than four inches (with a few minor exceptions) so that it will rest comfortably in the bottom a front pants pocket (not clipped to the edge) and which has one of the many, traditional, pocket knife shapes with a traditional number of specific blade shapes. 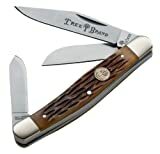 Traditional pocket knives come in many different distinct designs such as the English Jack Knife, the Pen Knife, the Barlow, the Stockman, the Sow Belly Stockman, the Congress, the Whittler, the Canoe, the Coke Bottle, the Gun Stock, the Sunfish, the Trapper, the Muskrat, the Peanut, the Copperhead, and the Texas Toothpick! In addition to these there are several specialty patterns such as the Electrician's knife, the Doctor's knife, the Fruit Tester's knife, the Boy Scout Knife, and the Swiss Army Knife. Whew! That was a mouthful! But, what truly defines each of these designs is the shape of the handle as well as the shape of and number of blades the knife has. For instance, a Barlow is immediately recognizable because is always has a Swell End English Jack handle with long bolsters whereas, a Stockman always has a Serpentine handle with a Clip Point blade, a Sheep's Foot blade, and a Spey blade. Pocket knife design was influenced by its intended purpose. For instance, a Pen Knife is a pocket knife that is smaller than an English Jack knife and which has a Clip Point blade on one end for general purpose use and a Pen blade on the other that was designed specifically for sharpening quill (feather) pens. Consequently, before the invention of metal ink pen nibs, anyone who had a need to write on a regular basis such as clerks, bankers, and lawyers inevitably carried a Pen Knife. Farmers, ranchers, and cowboys on the other hand needed an entirely different type of knife for their day-to-day needs and thus, the Stockman was invented to satisfy those needs. Therefore, a Stockman always consist of a Clip Point blade on one end for general purpose use, a Sheep's Foot blade for trimming animal's hoof's, and a Spey Blade for spaying and gelding farm animals on the other end. So, in order to determine what the best type of pocket knife is for your particular needs, you first need to determine what types of jobs you will be asking it to perform on a day-to-day basis and how large the knife needs to be to enable you to comfortably perform those jobs. Of the three questions I posed above, this one is by far the most important and thus, it should be considered first. So, what types of jobs do you intend to perform with your pocket knife? For instance, do you need a Gentleman's Pocket Knife to carry in your dress pants at the office? If so, then you would likely want it to be both small so that it is non-threatening to your co-workers and decorative so that it is aesthetically pleasing. In addition, you will likely want a Clip Point blade for opening envelopes and other such general purpose jobs and a Pen Blade for removing staples, etc. Thus, a Pen Knife or a Peanut would be an excellent choice for this purpose. On the other hand, for many years now many knife aficionados have considered the Barlow to be the best possible general purpose pocket knife design. On the other hand, if you are an avid outdoors-man, then the Copperhead, the Stockman, or the Trapper would all be excellent choices. However, let me state that in my personal opinion, the Stockman is without a doubt the best general purpose design ever invented because its three different blade shapes will allow you to perform most any cutting task you are likely to encounter either in the office, in your home, or in the outdoors. Your second consideration when choosing a pocket knife should be how large a knife do you need? Gentleman's knives are generally small and non-threatening whereas, a Barlow is generally a little larger and thus, it makes an excellent general purpose knife that is also non-threatening but is still large enough to perform most daily tasks around the office or around the house. Stockman's knives on the other hand, are generally available in small, medium, and large sizes depending on the needs of the user. So, if you are only performing light cutting tasks, you don't need a knife that provides a lot of leverage. However, if you work in an environment such as a warehouse, a hardware store, a feed store, or on a carpentry crew, etc., then you will likely be using your pocket knife for much heavier cutting tasks throughout the day and thus, a large Stockman or a Copperhead would be an excellent choice. In addition to the above mentioned considerations, the type of steel your pocket knife's blades are made from is also important. So, while the subject of blade steels truly deserves its own article (we have a couple, which can be found here and here), I will attempt to provide a short synopsis here. First of all, blade steels are divided into two categories; high carbon, non-stainless tool steels and stainless steels. Furthermore, a stainless steel is defined as a steel that has more than 12.5% Chromium by mass. In addition, high carbon tool steels will take an extremely sharp edge, will hold it reasonably well, and are relatively easy to sharpen but, they are also more prone to corrosion than stainless steels. On the other hand, some stainless steels will also take a very fine edge and hold it extremely well but, they are somewhat harder to sharpen and of course, they are far more resistant to corrosion than high carbon tool steels but, they are generally not as tough. As I mentioned previously, a Pen Knife is a small to medium sized folding knife with two springs, a slipjoint locking mechanism, and a Clip Point blade on one end and a Pen blade on the other. A Peanut is a small to medium sized folding knife with one round end and one square or round end with two springs, a slip-joint locking mechanism, and a Clip Point blade on one end and a Pen blade on the same end. A Barlow is a medium to large sized folding knife that usually features a Swell End Jack handle with long, metal, bolsters, two springs, a slipjoint locking mechanism, and either a Clip Point blade or a Spear Point blade with a Pen blade on the same end. A Stockman is a small to large sized folding knife with two springs, a Serpentine handle, a slip-joint locking mechanism, and a Clip Point blade and a Sheep's Foot Blade on one end with a Spey Blade on the other end. Incidentally, we recently reviewed two of the finest Stockman knives available today – the Boker Stockman and the Queen Cutlery Stockman. You can read the full article here. A Trapper is a medium to large sized folding knife that usually features a handle with a round end and a square end, two springs, a slip-joint locking mechanism, and a Clip Point blade with an extra-long Spey blade on the same end. Hopefully using this little article, you'll now know what to look out for when choosing your next pocket knife! If you have any questions or hints and tips you'd like to contribute – please feel free to add your comment below. Whatever you choose, please make sure it is made in the USA. You still can buy knives made in the USA, there are a lot of brands to choose from—Case, Canal St., Mooremaker, Buck, Bear and Son, Utica, etc. and you can find Schrade and Camillus made in the USA on the online auction sites. Support the USA knife companies. Do not buy any junk knives from China. The price is low but so it the quality. If you want to stay traditional, go for the 1095 or what Case calls the CV steel. Whatever you buy, buy one made in the USA. There are still knife companies in the USA–Buck, Bear and Son, Utica, Case, GEC, etc, and you will help this country and keep jobs here by buying a quality American made knife instead of some imported junk.